Don’t miss an original essay by John Grisham in the back of the book. 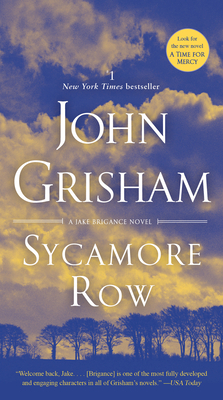 John Grisham takes you back to where it all began. One of the most popular novels of our time, A Time to Kill established John Grisham as the master of the legal thriller. Now we return to Ford County as Jake Brigance finds himself embroiled in a fiercely controversial trial that exposes a tortured history of racial tension. Seth Hubbard is a wealthy man dying of lung cancer. He trusts no one. Before he hangs himself from a sycamore tree, Hubbard leaves a new, handwritten will. It is an act that drags his adult children, his black maid, and Jake into a conflict as riveting and dramatic as the murder trial that made Brigance one of Ford County’s most notorious citizens, just three years earlier. The second will raises many more questions than it answers. Why would Hubbard leave nearly all of his fortune to his maid? Had chemotherapy and painkillers affected his ability to think clearly? And what does it all have to do with a piece of land once known as Sycamore Row? John Grisham is the author of a collection of stories, a work of nonfiction, three sports novels, four kids’ books, and many legal thrillers. His work has been translated into forty-two languages. He lives near Charlottesville, Virginia.